Our classic Azure Blue shirt reminds you of a light tropical sky and is probably our bestselling coloured shirt in our bespoke shirt collection. Made from medium weight two-fold cotton poplin, this shirt is a firm favourite for both men and ladies looking for a crisp light blue shirt to wear in and out of the office. 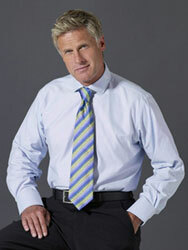 Cotton poplin is a popular choice for shirts due to its smooth finish and durability. 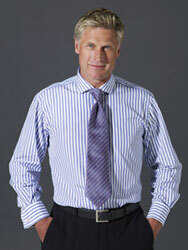 The standard weave gives a clean and crisp prominence to the Azure Blue helping you to stand out in a crowded office. All of our bespoke shirts are hand tailored to your selected specifications including collar, cuff and sleeve length. Simply select your preferences above, and we’ll take care of the rest.